The phrase “home office” is involuntarily in an association with luxurious rooms finished with precious wood and luxurious furnishings for many of us. Necessarily, a large desk and an armchair with leather upholstery, heavy blackout curtains with decor and thick carpet, a bookcase with glass doors, behind which flashing the backs of collectible books. Modern home office often does not even require a separate room. Large desks are no longer needed either as the present day electronic gadgets are placed on a small table tops, consoles. But even the most modest-size working area needs worthy design. No matter how much time you spend at the computer or desk – the functional segment shall meet the requirements of ergonomics, practicality and aesthetics. We prepared top 100 modern home office design trends 2017 in photos of real home offices (working areas) design projects for you boasting with variety of design methods. We hope that you will be inspired to create the perfect workplace in the framework of your own home. If you have the opportunity to equip a home office in a separate room, it would be simply a criminal not to take it. Many owners of apartments and private homes work at home our days. Advantages of the working activities within your own home are obvious – the most comfortable environment, there is no need to travel to and from work by public transport and much more. But shortcomings to have the home office are also present – households often ignore the need for privacy and distract busy family members from the work. That is why it is so important for freelancers to arrange a convenient, practical and functional working space in their apartment with the greatest possible ability for solitude. owners’ preference in the choice of style, color palette and other design solutions. 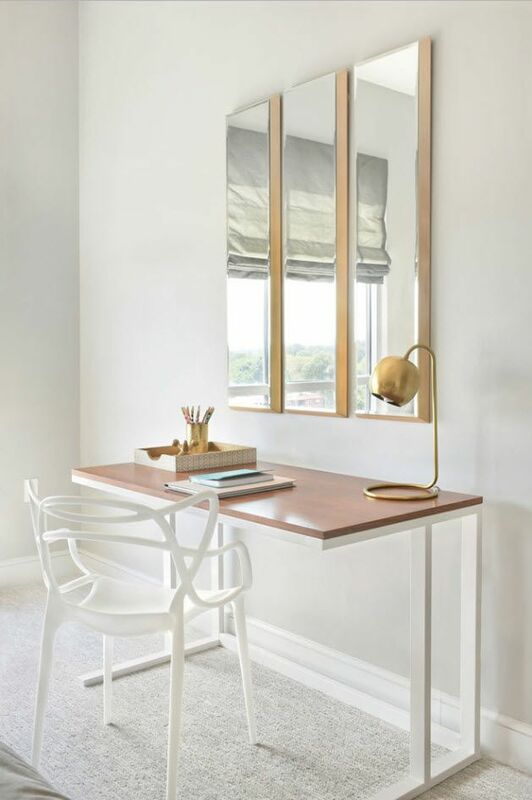 In addition to mentioned above selection criteria for the design of a home office, it is important to consider your own expectations from the character of the interior which your office should have. Workplace atmosphere should relax, soothe or invigorate? Or whether it should inspire creativity and mobilize all available reserves to be active? In any case, it is important to define the basic concept of the design. Other nuances can be refined with the help of auxiliary items and decor. Cabinet in a modern style is a conciseness and functionality, brought to the absolute. The calm and even, to some extent, minimalistic situation contributes to the to business mood. This room is furnished only with necessary furniture, almost completely devoid of decoration. Everything should be subordinated to one goal – the establishment of a maximum working attitude. 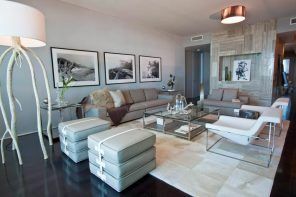 Strict forms and simple solutions are present in the room decoration and its furnishings. The only “whim” you can afford – colors and possible bright accents. But the elements of best interior traditions of English home offices can be also integrated in the modern home office. This can be done mainly by selecting the design for the storage systems. Bookcases and shelves in a classic style combine perfectly with the models of tables and chairs executed in modern style. What material do you associate with the interior of a home office? Almost everybody will answer this question unambiguously the wood. Finishing and furniture, decor and additional elements – expensive wood has always been the main decoration of offices, both as a reflection of the status of the house and its owners. Timber (or its effective imitation) is used no less active for the modern home offices. Only instead of luxurious carvings and massive furnishing, wood serves as the material for the performance of simple and concise solutions for decoration and arrangement of furniture and cabinet. The most important thing in modern home offices is a high level of illumination. Even small room must have window. If you need to work at home from dusk till dawn, it is necessary to foresee all variants of room illumination. Lightweight, translucent tulle on the windows (or without drapery at all following the trend of modern style), where the work desk is located. If you are right-handed, it is necessary that the light fall on the working surface from the left side. But the artificial light should also be considered. The central chandelier or recessed lights in the ceiling and a table lamp or wall sconce near the workplace are the most common variants. In order to increase the light level of your home office, experts recommend the use of bright surface finishing of the room. The white planes will not only help to create a light and easy look of usually small spaces, but also increase the visual volume of the room. 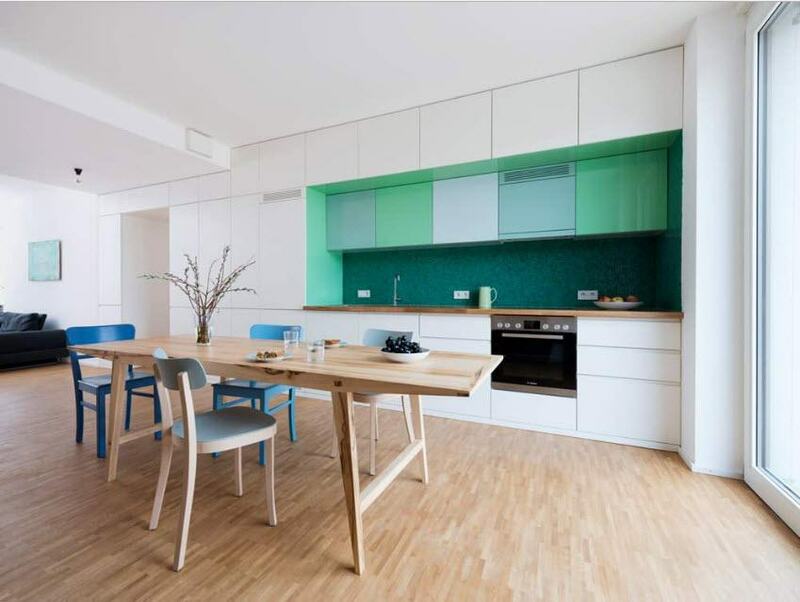 Coloring experts recommend to use neutral colors for the cabinet to create an atmosphere that will not distract from the main activity – the workflow. But the majority of the owners of apartments and houses regard this approach to be boring, expressionless. In order to bring an accent to calm, pastel interior of the office, it is enough to hang a colorful picture on the wall or buy a bright chair. Accent elements will not disturb you during business, but rather create a certain character of the interior image. The classic British offices often used blue color. 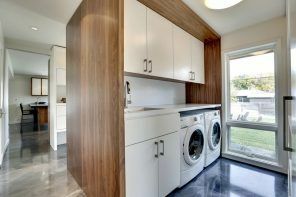 Modern style is not alien to the use of different shades of this color. Just be aware that the cool palette is recommended only for rooms located on the south side of buildings and filled with sunlight. Various shades of blue color can be used to finish the surface above the desk – they perfectly combine with the execution of furniture of the natural pattern. Contrast effect can be achieved if you use the cool shades of blue as the background for the snow-white furniture. Even some 15-20 years ago it was extremely problematic to organize two full-time workplaces in the standard apartment. Even small writing or computer desks occupied a lot of useful space of the room. But you must not forget about storage systems and comply with the rules of ergonomics to make workflow was not only productive, but also safe for health (currently and in the future). Nowadays it takes much less effort and much less space to organize two workspaces in one room. It is enough to attach the countertop-console (no legs help when placing two people at work surface) to a wall and place a couple of chairs. Modern PCs or laptops (tablets) suffice with narrow operating console. Another possibility of organizing a working surface for two is the use of the corner layout. With this arrangement, two people sitting people will be located almost back to back and will not interfere with each other’s working processes. Corner of the rooms is seldom used with maximum efficiency. To utilize it, you can hang open shelves or small modules with doors over operating console in an angular manner. 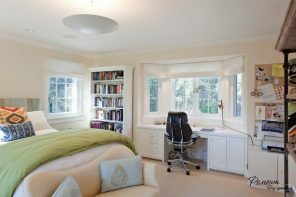 Most often it is not possible to allocate a separate room for a home office arrangement in modern dwellings. 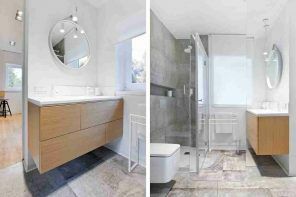 And the owners have to solve a difficult dilemma for the purpose of functional segment right at a particular room of their apartment or private house. Typically, the biggest room in any home is a living room, so here we should arrange the workplace. The advantage of a modern home office is that its organization requires of only three boards. One can be used as a table top, fastened to the wall, of the remaining two we can make shelves. Making the workplace in the living room is completely subordinated to the decisions of the color and overall design style of the room. If the living is furnished simply and concisely, it would not be expedient to use dressing in the office area too. As a rule, the working area in such premises does not play a role of emphasis. Often a desk, chair and storage system are executed in accordance with the overall color scheme premises and do not stand in the way of living. One of the workplace organization design techniques in the framework of the common room can be called a “cabinet in the closet.” The workplace is located just behind the hinged or sliding doors of cabinet. This approach helps to organize the living room atmosphere during the reception. But when necessary (usually for those who do not use the office as a principal place of business) cabinet can become a home office. Another widely used, in terms of the arrangement of the workplace, room is a bedroom. Very often people decorate a small home office in this secluded room. Herewith, a written or computer table is often used as a dressing table. Working segment versatility can be provided with the simplest solutions in furniture – table-top console, or compact desk and storage systems in the form of open shelves. In the classical or neo-classical bedroom, they use traditional motifs in furnishing workplace design as well. A desk and a chair or a chair with a backrest can be equipped with curved legs, decorative elements in the form of a wood carving. 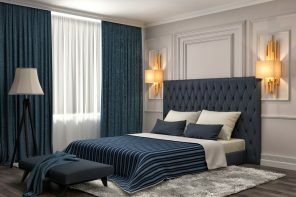 The upholstery chair or stool may also have a “classical” orientation: expensive fabric that is used for window drapery or upholstery of bed headboard. 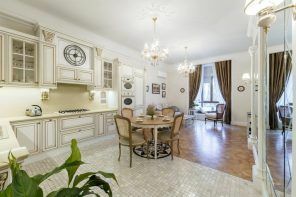 It is generally not difficult to arrange workstation in studio apartments or homes where the kitchen and dining room (sometimes the living room) are combined into one large room. 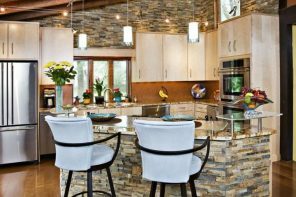 The cooking area often out of place, but it is easy to find a place for the installation of countertops and install chairs or chair with a back in “meal” segment. Obviously, the kitchen area in the combined room should be equipped with the most powerful and nevertheless quiet extract hood to not only cope well with the overall indoor air purification from products of food combustion, and also not to disturb owners with foreign sounds, which are located in the office segment. The owners of standard and small apartments not always have enough space. The need to broaden possibilities of their own homes is pushing owners of apartments with a modest area to equip auxiliary rooms such as balconies and loggias. Glazed and insulated balcony which has the necessary communication can become a great home office. As a rule, balconies and loggias can`t boast of a large area, but those of square meters are enough to arrange a convenient workspace. The main advantage of this place is its isolation (if a balcony or loggia is not adjacent to the bathroom). Compactness of modern furniture solutions for workplace organization allows you to create a mini-rooms literally in any niche or cubbyhole of an apartment or private house. 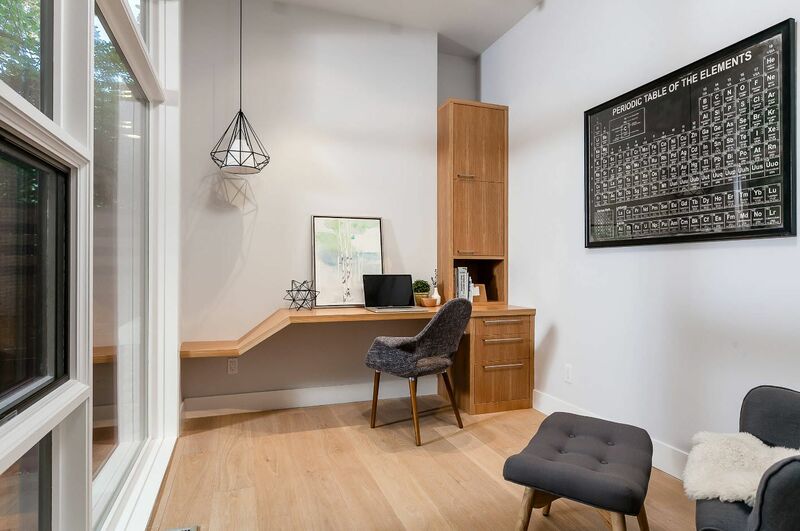 Even the most complex in terms of the geometry portion of your home can turn into an excellent home office, thanks to a built-in to the wall or suspended tabletop and a comfortable chair. Ideally, such a workplace must be near a window. But it is not always possible to meet this condition. Anyway, a desk lamp or wall lamp above the work surface are essential. The hosts two-story private houses and duplex apartments often use the space under the stairs for the organization of the workplace. Such auxiliary space is not the best option for the home office in terms of illumination, because the entire load falls on the artificial lighting (their power level should be high enough). But in most cases homeowners have resorted to such measures in no other possibility – it is simply nowhere else to equip a home office. Here are some design projects of home offices, furnished under the stairs or just near it. The upper tier of two-level apartments can be used in order to arrange a home office. The landing on the second floor two-storey houses may be free for the organization of office space. Depending on the size of the functional zone at the top level, you can place not just work desk with chair and storage system there, but also a small sofa for relaxing or chair with a floor lamp for arranging a reading area.